Healthy subjects build a prosperous nation. Health is the fundamental right of the citizens.Public health measures contribute to the quality of life. Oral health is an integral part of generalhealth. In India, Dental Public Health is four decades old. It has seen a paradigm shift from itshumble beginnings. Therefore it is imperative that the dental public health professionals reorientthemselves in these changing times. The practice of dentistry is becoming more complex and challenging. Science and technology are developing so rapidly that dental practitioners have to constantly assess whether the materials and procedures they are using in their practices still represent the best treatment for their patients. Meanwhile, patients want clinicians who know, rather than believe, that a prescribed treatment works best. It is not enough to do the thing right; it is also necessary to do the right thing. In reality, most clinical care and policy decisions are complex, time-dependent, and based on clinical experience, patient/ population needs and evidence with varying degrees of certainty. One method for identifying, evaluating, and implementing good clinical data in a timely fashion is evidence based health care. Evidence Based Dentistry (EBD) is the integration of the best research evidence with clinical expertise and patient values. It is understood that experience is valuable but not always represent valid evidence; physiologic principles are sometimes inaccurate and the assessment of evidence requires knowledge of the rules of evidence. EBD focuses on the basic principles of epidemiology, formulation of the clinical question, search and acquisition of scientific evidence, critical appraisal and application of evidence in dentistry. Introduction: Oral health care system remains unexplored by many patients, in spite of the effort of health care workers to reach them. Oral health of children and their parental attitude to various aspects of dentistry needs a thorough study. Objectives: 1) To understand the perception of dental care system among parents and their knowledge, attitude towards dental care. 2) To explore the reason why parents fail to take their children to the dentist. Material & Methods: A cross sectional descriptive household survey was conducted on a sample of 215 parents, randomly selected among residents of Davangere city. Information of gender, education, occupation and number of children was obtained. Questionnaire consisted of questions to assess behavior, attitude and knowledge of parent. Results: Response rate of 92.5% was observed. When respondents were asked whether they check their wards oral health regularly number of positive responses increased as education status increased but response was inversely related to number of children. Similarly awareness to take their child to dentist every 6 months, knowledge about fluoride, pit and fissure sealants were in increasing order of education status. Conclusion: The present study highlights on various aspects that prevent parents from taking their children to dentist, like being busy in their everyday life, anxiety, priority between daily routine and dental treatment, expensive treatment and lack of preventive treatment awareness. Introduction : Oral health knowledge is considered to be an essential prerequisite for Gynaecologists. Gynaecologists are the primary care providers of the pregnant women who can educate them regarding general health and oral health. Hence they should have knowledge about oral health to guide their patients. Aim: To assess the Knowledge, Attitude of Gynaecologists towards oral health care in pregnant women. Materials and methods: A cross-sectional questionnaire based survey was conducted among Gynaecologists in medical colleges located in Hyderabad. A pretested close ended questionnaire was prepared and distributed. Results: A total of 103 Gynaecologists participated in the study (Female=98, Male=5). Fiftyseven percent of them strongly agreed that oral health is an important component of a pregnantwomen's general health and most of them (84%) agreed that Gynaecologist has an important role inpromoting their patient's oral health. Fifty seven percent of them strongly agreed that usage of tetracycline during pregnancy will adversely affect the child's teeth. Conclusion: As Gynaecologists are the primary health care providers they need to know about dental health science to educate their patients. There is a need for conducting Continuing Medical Education programs for them. Introduction : Fluoride has played a pivotal role in oral health promotion over the past 50 years. The benefits of low levels of exposure are outweighed by adverse effects at high level. The problem of high fluoride concentration in groundwater resources has become one of the most important toxicological and geo-environmental issues in India. A comprehensive understanding of its sources, optimum concentration and adverse effect greatly potentiate the use of fluoride with Aim : Assessing the knowledge, attitude and practices of rural people about fluorides and fluorosis. Materials and methods : Atotal of300 subjects aged 18-30 years were selected by multistage cluster sampling technique. A self administered questionnaire containing 15 close ended questions based on knowledge, attitude and practices regarding fluoride and fluorosis was used for the purpose of collecting data. Results : Majority of people (76%) were aware of the presence of fluoride in drinking water. About (71 %) were of the opinion that fluoride in drinking water has an effect on oral health. Most of them (78%) were not aware of the permissible concentration of fluoride in water and of the presence of fluoride in the tooth paste. A lesser proportion of subjects knew about the role of fluoride role in the prevention of caries. About 68% of the people were of the opinion that the yellow discoloration of the tooth surface causes embarrassment while smiling or speaking. Conclusion : Overall results suggest that knowledge is deficient with respect to optimum concentration of fluoride, its role in prevention of caries and the presence of fluoride in food and tooth paste. Attitude and practices are also unfavourable as far as oral health is considered. There is an urgent need to sensitize the community people regarding precise role of fluoride in oral health. Objectives: To evaluate the demands and needs for dental care and to identify the level of dental and periodontal status in population of Gwalior District, India. Methods: A total of 1000 (483males and 517 females) subjects in Gwalior District were examined. The chief complaint of each patient was recorded and considered to be a measure of demand for dental care. The World Health Organization's (WHO) basic methods (4th edition) was used to determine the tooth-based normative treatment needs. Periodontal status was determined by using the Community Periodontal Index of Treatment Needs (CPITN). In addition, prosthetic normative needs were assessed. Results: 35.7% & 27.9% of 35-44 age group & 45-64 age group had painful gums as a chief complaint respectively and 42.7% of >65 age group had mobility as the chief complaint. Conclusions: Steps should be taken to overcome this disparity and more emphasis should be given to meet the normative need of the people through government and non government organizations to improve the oral health. Introduction: The third molars continue to generate more controversies concerning eruption patterns and pathologic sequelae than any other tooth in the oral cavity. As very few epidemiological studies are available reviewing the status of third molars and associated pathologies. The present study was conducted to give a baseline data on third molars. Methodology: A total of368 post graduate students (147 males, 221 females) were selected by systematic random sampling. A questionnaire containing demographic information was filled by the participants; clinical examination was done by the investigator to check the status (Unerupted, partially erupted, completely erupted). The angulations of the third molars were classified based on Winter's classification. Non parametric chi square test was used to assess the data. Results: The impactions were more in mandible (47.8%) than in maxilla (44.8%), females(48.8%) than males (42.1%). the proportion of the congenitally absent were 8.2%, unerupted were27.8%, partially erupted were 18.3% and completely erupted were 43.2%. Among the impacted third molars, Mesioangular impacted third molars were highest in number and in percentage 40.5%(275) followed by vertical 35.6% (242), horizontal 12.6% (86) and the distoangularll.1% (76).34.4% of the third molars were with pathologies which included pericoronitis, dental caries,periodontitis etc. Conclusion: The overall prevalence of impacted third molars was 46.12%, which was higher in females than males, mandible than maxilla. Almost one third of the third molars were associated with pathologies. Aims and Objectives: This study was conducted to investigate the association between oralhealth related factors and early childhood caries (ECC) and severe early childhood caries (SECC) in 3-6 year-old children. Materials and Methods: Data were collected from randomly selected 194 children, between 3 and 6 years of age, and their mothers, regarding oral hygiene habits, infant-feeding habits and salivary contact between the mother and the child. Children's deft, defs, and severity of early childhood caries were recorded. Results: Out of the 194 children examined, 79 had early childhood caries and 59 had severe early childhood caries. Statistical analyses revealed significant association between early childhood caries and Age of the child, breast feeding habits, bottle feeding, presence of Caries in the mother, brushing habit of the mother and increased dietary carbohydrate intake. Age of the child, Presence of caries of mother, DMFT /DMFS scores and Dietary habits of the mother were found to be significant risk factors for the severity of early childhood caries. Conclusion: It was apparent from this study that no single risk factor played important role in development of early childhood caries in preschool children. This study most certainly corroborates multifactorial etiology of early childhood caries. There is a need for education about the various risk factors for ECC, especially to the new mothers. 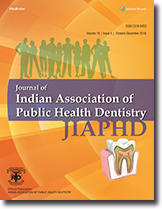 Aim : To assess point prevalence of dental fluorosis and dental caries and their interrelationship in children of age group 10 to 14 years from areas in Lucknow district with low (0-0.5 mg/1), moderate (0.5-1.1 mg/1) and high (>2 mg/1) concentration of fluoride in drinking water. Material & Methods: Atotal of 531 school going children were included in the study. Dental caries and dental fluorosis was recorded (WHO, 1997) under standardized conditions. All children residing in their respective areas since birth were included and only permanent teeth were examined. Intra-oral examination was carried by single examiner. Results: Mean DMFT was found to be 2.21,0.96 and 0.78 whereas mean CFI was found to be 0, 0.02 and 0.36 from the three areas respectively. A statistically significant (p<0.001) difference was observed in caries prevalence in low fluoride area as compared to other two areas whereas dental fluorosis prevalence in high fluoride area was found to be highest and also statistically significant (p<0.001) from other two areas. Conclusion: It was concluded that dental caries increases with increasing severity of fluorosis in low, moderate and high fluoride areas. Thus a positive relationship is seen between dental caries and dental fluorosis in all three areas. Objective: To assess the prevalence of dental caries and dental fluorosis in areas with varying levels of fluoride in their drinking water in Prakasam District of Andhra Pradesh. Material & Methods: Atotal of2401,12 year old school children were examined, dental caries experience was recorded using Decayed, missing and filled surfaces [DMF (S)] index and dental fluorosis was recorded using Tooth Surface Index for Fluorosis [TSIF index]. Drinking water samples were collected and analysed for the level of fluoride ion and the areas were classified into below optimal, optimal and above optimal areas according to World Health Organization [WHO] recommendations. Results : Number of children with dental caries was 917 accounting to a prevalence of 3 8.19%, with a mean Decayed Missing and filled surfaces [DMF(S)] of 1.12 ΁ 0.79. The mean DMF(S) scores were found to be statistically insignificant amongst the various socio demographic variables. It was found that the occlusal surfaces was the most commonly affected. The number of children with dental fluorosis (e" one tooth surface affected) was 1085 accounting to a prevalence of 45%.It was found that males had an odds ratio [OR] of 1.53 (95% C l 1.24 - 1.53) compared to females. Scores in the categories of 1 -3 which represent various degrees of whitish discoloration were the most common scores in this study. Conclusion: Dental caries was found to be insignificant with the socio demographic factors studied in this study as well as to the levels of fluoride in drinking water. Dental fluorosis was directly associated with the fluoride level in drinking water. Aim: To assess the periodontal status of inmates in Central Prison, Chennai. Material & Methods: A Cross-sectional survey was conducted among 1060 inmates from 3 divisions of Central prison, Chennai. Periodontal status of the inmates was assessed by a single investigator using the Community periodontal index according to WHO specifications. Results: The present study revealed that a high proportion of inmates(97.6%) were affected by periodontal disease. Among the study population of 1060 inmates, 2.1%, 6.3%, 79.5%, 10.3% and 1.8% of male inmates had healthy periodontal status, bleeding gingiva, calculus deposits, shallow pockets, and deep pockets respectively. Among female inmates, 8.6%, 68.6%, 14.3%, and 8.6% had healthy periodontal status, calculus deposits, shallow pockets, and deep pockets respectively. Conclusion: This survey demonstrates that a large proportion of inmates were affected by periodontal disease. The alarming rate of periodontal disease among the inmates necessitates the need for dental health education among this disadvantaged group. Introduction : Various models for predicting caries risk have been developed with good results. One such recently developed model is Cariogram. Cariogram systematize the evaluation of various risk factors for caries and recommends targeted preventive interventions based on caries risk. Aim: The purpose of the study was to assess the caries risk profile of 10-12 year old differently abled children using Cariogram. Materials and Methods: This was a cross sectional study with 78 participants. Parents of each participant were interviewed to gather the information regarding oral hygiene habits, any type of systemic or chronic illness. A self administered dietary questionnaire was given to them to record diet history. Subsequently clinical examination and salivary tests were carried out. The caries risk of each individual was then obtained by drawing up the Cariogram. Result: The Caries risk for each sector obtained was 6.65% for diet, 10.08% for bacteria, 15.85% for susceptibility and 5.88% for circumstances. Overall, the caries risk was 38.46% and chance to avoid caries was 61.54%. Conclusion: The study demonstrates that Cariogram is a useful model in determining caries risk and plan targeted preventive interventions in differently abled children.